During the years 1934-1939, Soviet dictator and Communist Party General Chairman Josef Stalin ordered what later became known to history as the "Great Purge" - a period of brutal political repression, torture, imprisonment and mass murder in the Soviet Union. Launched under the auspices of purifying the Communist Party of ideologically-unreliable elements and rooting out fifth columnists within its ranks, the purges focused initially on party leadership. However - fueled by Stalin's paranoia - they soon expanded into the military, government bureaucracy and wider Soviet society. Members of the intelligentsia, senior government bureaucrats (nomenklatura), professionals, land-owning farmers (kulaks), members of the military and anyone else suspected of being an enemy of the state were swept up in the wave of suspicion and mutual distrust. Suspects were typically charged with espionage, anti-Soviet agitation, counter-revolutionary activity, or the like; if no "evidence" of wrong-doing could be found, it was manufactured by the secret police - the dreaded NKVD - or obtained via "confessions" extracted under torture. Following a perfunctory hearing or trial with a pre-determined outcome, most of those charged were imprisoned in the vast Soviet system of gulags (concentration camps) or executed. At the height of the purges, in 1937-1938, an estimated 1.2 million people lost their lives. Aware of a resurgent Germany on his western flank, and a militarized and powerful Japan on his eastern frontier, Stalin - fearful of infiltrators and fifth-columnists within the ranks - ordered Commissar of State Security Nikolai Yezhov to purge the Soviet senior officer corps. Acting under orders from Premier Stalin, who sought a pretext to move against the officer corps, the NKVD instructed agent Nikolai Skoblin to pass incriminating misinformation implicating Red Army Field Marshall http Mikhail Tukhachevsky, to Reinhardt Heydrich, the head of the Sicherheitsdienst (SD) - the intelligence arm of the German SS-Gestapo. Heydrich arranged for the information to be planted in such a way as to implicate Tukhachevsky and a number of other top Soviet general officers. So began the purge of the senior officer corps of the Soviet army and navy. By the time the process ended in 1939 - with war on the horizon - the military had been decimated. Three of the five Marshalls of the Soviet Army - including Tukhachevsky himself - were executed; 13 of 18 army commanders, 8 of 9 admirals, 50 of 57 army corps commanders, and 154 out of 186 division commanders were removed; some were executed, while others were imprisoned or forced into retirement and exile. Some of the survivors were later ideologically-rehabilitated and brought back into uniform, but by then, the damage had been done. Among its many effects, Stalin's purges left the Soviet Union utterly ill-equipped to fight the Second World War. Many of the most-experienced and proficient military officers in the Soviet army and navy - men like Marshall Tukhachevsky - were lost during the madness. More often than not, these able commanders and leaders were replaced by ideologically-reliable but militarily-incompetent Communist Party hacks. When the Germans launched Operation Barbarossa and invaded the Soviet Union in June, 1941, the Russian people paid an unspeakably terrible price for Stalin's short-sightedness, cruelty and paranoia. Stalin's purge of the Red Army is historically-significant for many reasons, but perhaps none more important than that he episode illustrates the folly of allowing ideology to trump military necessity, practicality and pragmatism. Stalin's evil and feckless acts left his nation and people all-but-defenseless in the face of the Nazi onslaught - as the purges crippled the ability of the Soviet armed forces to respond to the invasion in a timely and effective manner. It is no exaggeration whatsoever to state that the U.S.S.R. came within a hair's breadth of surrendering when the Germans were approaching the gates of Moscow in the winter of 1941-1942. Final victory over the fascist invaders took four long years and cost some twenty million Soviet lives. In 2012, Lt. Colonel Matthew Dooley, a much-decorated combat veteran and soldier with an impeccable record and fitness reports/evaluations to match, was summarily-dismissed from his post at the Joint Forces Staff College and publically-criticized by Army Chief of Staff General Martin Dempsey for making remarks critical of Islam in his course, Perspectives on Islam and Islamic Radicalism. The Joint Forces Staff College, which had approved the content of the course a number of years previously - came under pressure from more than fifty Muslim interest groups - recanted and fired Dooley. Today, it is government-wide policy (including military and federal law-enforcement agencies) that educational materials must portray Islam in a favorable - even flattering - light. This edict from on-high amounts to an official whitewash of the real history of Islamic world and its relations with the Judeo-Christian civilization. Likewise, military personnel who are not one-hundred percent "on board" with the pro-feminist and pro-homosexual agenda of the White House and its advisors are being shown the door in record numbers. The case of U.S. Air Force Senior Master Sergeant Phillip Monk illustrates the ideological fanaticism now found in the "new" armed forces. Despite his reluctance to do so, Monk was ordered by his commanding officer, a lesbian, to go on record with his views about homosexuality. A practicing Christian, Monk replied that he was against it - and was then relieved of his duties and censured by his command. Not only are U.S. military personnel being indoctrinated to hold favorable but historically-inaccurate views of Islam, they are being taught that traditional American and Judeo-Christian values have no place in the military. Indeed, they are being taught that these values are those of the enemy. Military chaplains report that they are being pressured - in some cases, against their religious vows - to perform homosexual marriages; other personnel report that crosses have been ordered removed from chapels located on bases in Afghanistan. It has come to light that certain administration officials want proselytizing by Christians outlawed within the ranks, but no such prohibition has been put forth for Islamic initiatives of the same kind. 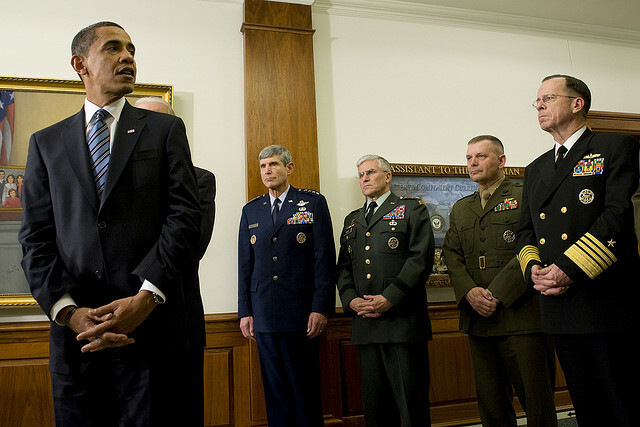 If Obama's new military isn't only anti-Christian, it is atheist. Because of the objections of a single atheist at that institution, cadets graduating from the U.S. Air Force Academy are now sworn-in as officers using an oath which contains no reference to God. On similar lines, an Air Force officer was told to remove a Bible from his desk for fear that it would "offend" someone. Team Obama is relentlessly purging the U.S. military of individuals who do not share its ideological worldview, but that is not all; it is also removing high-ranking officers who have knowledge of an incriminating nature concerning the fiasco at Benghazi, or who have made statements critical of the administration's handling of the incident - which led to the deaths of four Americans. U.S. Army General Carter Ham, who commanded U.S. African Command when the consulate was attacked, was summarily-relieved of his post and forced to retire in April, 2013, after making remarks critical of the State Department's decision not to send available reinforcements to rescue the besieged embassy. Likewise, Rear Admiral Charles M. Gaouette - the former commander of Carrier Strike Group Three (CSG-3, U.S.S. John C. Stennis) - was relieved of his post after contending that aircraft from his strike group could have made it to the scene in Tripoli in time to aid/rescue the trapped personnel. Officially, Gaouette was forcibly-retired for making "racially-insensitive remarks" and public use of profanity; the real reason he was forced out was for daring to contradict administration propaganda about Benghazi. There are many other examples of equally-disturbing - if not alarming - behavior on the part of administration officials. This author is acquainted with numerous veterans of the U.S. military, as well as a number of personnel presently on active/reserve duty. They independently corroborate the substance of these findings. Former Congressman (R-FLA) and retired U.S. Army lieutenant colonel Allen West has called for a Congressional investigation, noting that almost two hundred high-ranking officers have been dismissed from the military during Obama's administration. Such a high number of dismissals in so short a period of time is virtually unprecedented, West notes. A number of high-ranking former army officers have gone on record in agreement with West, including Major General Paul Vallely, Lieutenant General William G. Boykin (one of the founders of Delta Force, the U.S. Army's elite counter-terrorist unit), and Medal of Honor recipient Major General Patrick H. Brady. "'There is no doubt he [Obama] is intent on emasculating the military and will fire anyone who disagrees with him' over such issues as 'homosexuals, women in foxholes, the Obama sequester...'" Brady commented to World Net Daily investigative reporter F. Michael Maloof. Commenting for the same story, retired U.S. Navy Captain Joseph John stated that the "bigger picture" is that "the U.S. Armed Forces have been under relentless attack by the occupant of the Oval Office for five years." Like the Soviet military prior to the Second World War, the present-day United States military is being gutted in the name of ideology. It is also being hollowed-out by corruption, political and interest-group patronage and leftist social experimentation. Finally, the upper ranks are being purged for reasons of political expediency and to allow the regime to cover its tracks concerning the Benghazi debacle. The Founding Fathers greatly-feared large standing armies; James Madison spoke of them in the following terms, "A standing military force, with an overgrown Executive will not long be safe companions to liberty. The means of defense against foreign danger, have been always the instruments of tyranny at home." By tradition and legal precedent, the U.S. armed forces are supposed to remain ideologically- and politically-neutral. Under Obama, that neutrality has been tossed out the window. The on-going purge of the U.S. armed forces makes abundantly-clear that he means to transform the fundamental nature of the military and in so doing, mold it into a force which will do his bidding, no questions asked. That fact ought to worry all thoughtful Americans. Some of our most-decorated and honored soldiers are doing their best to warn us of the danger - but will we - and the members of Congress - listen?